Bob and Barbara began their square dance involvement in 1985. Over the years, they served in varying capacities with the Eastern District Square and Round Dance Association, the North Shore Square and Round Dance Association, the Square Dance Foundation of New England, the Acton Square Wheelers Dance Club, the Co-Op Committee, the Guidelines Committee, the New England Square and Round Dance Conventions, and the Silva Swingers Square Dance Club. They have attended countless dances, meetings and work sessions and taken a position on many occasions, looking out for best interest of the dancers. They have stepped up to the needs of their clubs and organizations on many occasions and have truly contributed to their success and yes, even survival. Recognizing that people are the driving force in this activity, they are the Chairpersons of the SDFNE’s awards committee and have traveled far wide throughout New England honor those recipients. Barbara has created fund raising quilts and sewed convention banners for the square dance activities, on behalf of the SDFNE’s preservation of square and round dance history. Bob is reviewing and digitizing EDSARDA’s history. Where ever a helping hand is needed, Bob and Barbara are always there. They truly represent aspect of the Square Dance Foundation of New England’s goals to Promote, Preserve and Perpetuate the activity so that today’s dancers and future generations can benefit and enjoy this great American Square Dance. 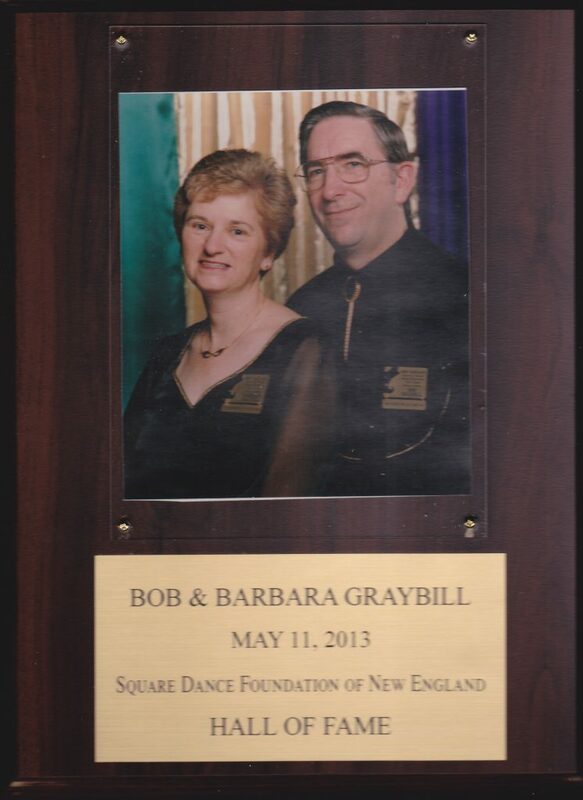 Having known of them for quite some time and having observed their contributions over the years are proud to induct them into the Square Dance Foundation of New England’s Hall of Fame.